The Exiled Realm of Arborea (abbreviated as TERA) is a free to play 3D fantasy MMORPG with visually stunning graphics quality and a very intense and rewarding combat where skill, position, timing and aim determine success in combat. Players can use a controller or a keyboard and mouse, and they have full control over the attacks. Also, TERA is set in a world where the players dictate the flow of the economy and individually impact the community environment. Ages ago, in a realm torn apart by war and strife, Arun and Shara chose to flee and start new lives. Using their immense power, they shaped a new universe and turned their backs on the constant struggles of the old one. They set aside their implements of war. Shara flung a ring into the sky and it burned brightly and illuminated their world. Arun and Shara laid down to rest and began to dream. Their tears formed the seas and their bodies became the continents. Their breath created the winds and their minds dreamed up all manner of creatures and plants. From the heart of each titan came a spring that became the Fountain of Shara and Fountain of Arun. These fountains were the rawest source of primal power in their new world. Action combat beyond "point and click”, where players control attack direction. Seven character races and eight classes, hundreds of monsters throughout 80 + zones and thousands of quests. Advanced enemy AI and enormous bosses. It offers the chance to play with mouse and keyboard or a PC-compatible console controller. It’s a faction-free world where all players can impact the community as well as the social, political and economic structures. The ancient amani were proud and strong, but a trick of fate deprived them of their god's protection and they were enslaved. After winning freedom, the amani vowed "Never Again!" If you like sharp teeth, horns, and fighting for honor, this is the race for you. Bold, brash, and independent, the castanics are willing to work together for the common good, but only so far as the common good doesn't take too long or come at too high a price. A peaceful and noble race, barakas are ferocious in defense of the weak. Their imposing presence conceals their true strength; baraka are giants in intellect as well as physicality. Elins are the divine "children" of the goddess Elinu, but do not mistake their waif-like appearance for innocence. Elin generals are among the world's most fearsome. Fewer than 100 years ago, the "Children of Karas" were actively at war with most of the world. However, their commitment to cooperation is a logical and necessary part of their culture, and they were among the first forces to stand against the Argon invasion. Humans are optimistic, curious about the world, and highly valued as diplomats and leaders. Humans naturally build communities, a trait that helped keep their culture strong during 2000 years of forced exile. The popori kingdom is comprised of animals imbued with a spark of divine energy. When "awakened," they cease to be rabbits, cats, and dogs, becoming instead fearsome defenders of the natural order. Armies of poporis feature heavily in many ancient battles, and no other race can raise an effective fighting force as fast. A lancer is a heavily armored fighter focused on anchoring a battle. It generates maximum threat with shouts and special attacks, sacrificing movement and attack power for the best durability in the game. Lancer skills are adaptable to any party size, including an army of one. Quick attacks and high mobility make a warrior essential to group play, but also very survivable while soloing. Tanking with this class is difficult, but possible. A warrior's skills are meant to cause damage, occasionally help draw aggro, and move around a battlefield. Warrior skills are versatile, and really shine in certain situation. The sorcerer is a ranged damage class focused on annihilating the enemy with high-damage "nuke" attacks. A sorcerer's job is to kill things quickly. When grouped up, their high damage attacks decide which enemy dies first. The priest is a robed magic user whose primary role is to restore health and vitality. However, a priest is not to be taken lightly—the same power that revives allies can also smite foes. Priest skills sustain a party through long and difficult encounters. Berserkers use charge-up attacks to deal massive damage. They can also block incoming frontal attacks, though they lose MP quickly when not attacking. Berserkers are constantly in motion. They excel in multiple-opponent situations, both as part of a group and solo. A lightly armored, agile fighter with a devastating greatsword. High damage attacks combine with evasive maneuvers for a dynamic combat style. Slayer skills are quick, precise strikes that knock over and incapacitate even the largest and strongest of foes, leaving them vulnerable for additional attacks. The archer is a highly mobile, ranged dps class. By channeling energy into the bow, the archer is capable of a wide range of attacks, dealing massive burst or rapid damage to foes. Archer skills poison, stun, trap, and damage targets, giving them advantages in any encounter. Mystics are a strong support class with skills to protect and enhance their party through buffs and auras. They also summon mighty thralls to assist, heal, and aid them in battle. A mystic's skills prepare them for any situation, with a good balance of offense, defense, and support options. The Valkyon Federation is an alliance of seven member races that formed to battle the argons and provide stability to the continents of Arun and Shara. As a representative government, the federation has organized settlements around the world into provinces, each of which is administered by an elected official known as a vanarch. For players, becoming a vanarch is the ultimate accolade. As a vanarch, your character is the best of the best, a member of an elite group that has money, power, and fame. Vanarchs make decisions that affect every player on the server, and every player on the server can hold them accountable when it's reelection time. A vanarch's term of office is three weeks long, but the political system is always cycling. A week after the election, registration opens again for all provinces. Actions taken in that first week will make a big difference for vanarchs who want to stay in office, because they'll need to receive the most votes again when the next election comes around. 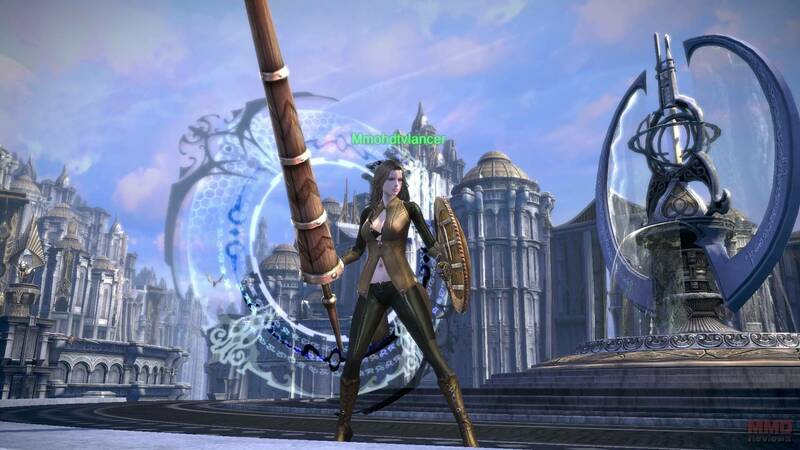 The free-to-play model of TERA has two base account types: the free user and the veteran. Limitations exist for free users merely in the form of functional option restrictions, such as the number of character slots or the number of safe deposits available. Subscribed members receive further advantages with regard to game comfort: shorter cooldown times for instances, increased experience point yields or an epic mount. Great game – once you go to True Action Combat System you can never go back! 10/10 Graphics and Gameplay.